YOUTH SHOULD PROTEST But How? RECENTLY I got a letter from a reader who disagreed with something I had written about modern music in The Plain Truth. He wrote: "I would like to take exception to your implicit condemnation of the sociological phenomenon referred to as 'punk rock.' You equated it with... child abuse... and the decline of marriage stability, gang violence, drug abuse, and suicide." It is true that's what I said — and that's what I meant. I did indeed see today's outrageous music styles as yet another symptom of the decay of Western morality. The writer went on, "In fact, the punk movement is a protest [emphasis mine] about the decline of Western values rather than another symptom." His letter went on to challenge me and the magazine for not understanding what the punk rock movement is all about. And that made me think, for after all, this is a magazine of understanding. So I listened to punk and watched video rock (late at night, when my teenage daughters were in bed, and braving my wife's incredulous looks). Nothing I saw convinced me that I had misjudged these music styles. The outlandish music arrangements, the extraordinary hair and clothing styles, the obscenity, the preoccupation with the macabre and the bizarre, the anger and rebellion that seemed to consume the musicians, along with the degenerate lifestyles — sorry, there was no way in which I could agree that punk rock was merely a protest about rather than a symptom of the decline of Western values. But then last December some of the leading British pop stars got together and made a record. The entire profits of this record were donated to Ethiopian famine relief. They donated their time free, and under the general heading Band-Aid recorded a song, "Do They Know It's Christmas?" This record, as you probably know, topped the charts in several countries and raised millions of pounds for starving Africans. In January this year, leading American stars made a similar gesture, with a recording "We Are the World." It also has become a spectacular success in raising funds for Africa. These have been kind and generous gestures, and all of us who ache to help ease the agony of Africa should appreciate what these young musicians have done. And even though you may not like their music, it makes you like them a whole lot more. 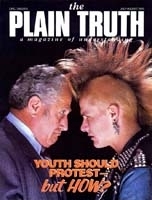 Now I think I understand more of what the reader was telling me, when he explained that punk rock is a protest. When young people dye their hair green, pink and orange, stick safety pins through their ears and dress in rags, they realize that they are making themselves offensive to more conventional folk. They do it on purpose. There's nothing particularly new about that. Every generation has its nonconforming youth. There were the flappers of the '20s, the beatniks of the '60s, and the hippies of the '70s. They went out of their way to be different while their parents worried and their grandparents rolled their eyes to heaven and asked 'what the world was coming to. But many of them grow out of it. And inevitably, some of what was "unacceptable" finds its way into our permanent culture. For example, when I was a college student, more than 20 years ago, I wrote a research paper for a course of music appreciation. I made the point that in 20 years time (that is, now), the music of the then — beyond-the-pale Beatles would be considered an important influence in serious music, to be taken quite seriously by "proper" musicians. "Nonsense," said the instructor, and gave me a terrible grade. As time goes on some of the outrageous becomes accepted even as the protesters mellow. The hippies of yesterday have, generally speaking, settled down into responsible jobs. The students who closed the campuses in the '60s still — somehow learned enough to earn their living today. Most of the bobby-soxers and teeny-boppers who screamed after the rock and roll stars 25 years ago have become mothers, and now have their own teenage children to worry about. There comes a time when the idealism of youth gives way to reality. And so, today's rebels eventually will cut their hair (or let it grow out again, as the case may be), put on more ordinary clothes, and get on with the job of making a living. And that, in certain ways, will be a shame. A teenager today is right to be indignant. As Pope John Paul II said, "They didn't ask to be born into a dangerous world." They didn't cause it, but they will Inherit it. Why shouldn't a teenager in today's world feel like offending conventional values? Where, he might ask, have conventional values got us? Why shouldn't he or she be frustrated at a world that can send men to the moon and make other stunning technological advancements, and yet cannot solve the problem of keeping African children from dying of starvation? Why shouldn't a young person in. America's Midwest, or Europe's Common Market, be baffled and indignant on realizing that some farmers are being paid not to grow grain, and that while the Western world is awash in surplus food, African babies are starving? How dare we spend unthinkable sums a week on weapons, when 300,000 Asian children go blind each year for the want of three cents' worth each of Vitamin A? A 16-year-old today has never known a world in which man has not walked on the moon. He has his own calculator, transistor tape player and is not awed by the computer. He takes those wonders for granted. But if we can do that, why are people still living in poverty? Why should a teenager feel that he or she has to embrace the traditional, accepted values of a world like this? What's so great about "the Protestant work ethic" when governments admit that they can offer so little prospect of constructive employment now, in the future, or, as is the case of some countries, possibly ever? Perhaps older people do not give the young enough credit for perception. Many teenagers are not just "rebels without a cause" or going through a difficult stage. They are deeply disturbed by the crazy, mixed-up world that they soon must inherit. My teenage daughter was recently looking through a copy of a newsmagazine. She was reading an article describing the phenomenal success of a doll that comes complete with adoption papers. Parents were literally fighting each other in the stores to get hold of one of these at a cost of around $30, for they had become an instant status symbol. On the same page was an advertisement asking for help to support underprivileged children in Third World countries. They were asking for donations of around US $14 a month. My daughter was furious. "Thirty dollars for a stupid doll, and they have to beg people to give $14 for a real baby... that's ... that's — " Words failed her! Why, then, should we expect young people to embrace the values of a world where half the population live in squalor, misery and poverty, and where everybody — rich and poor — lives under the threat of nuclear extinction? When a group of young musicians see children dying in Ethiopia and are provoked to use their talents to do something about it, it is a good sign. This is not a world that should be taken as it comes. It needs something to be done about it. It is a situation that cries out for protest. But by protesting, surely you should not make matters worse! Young people today must consider this. They aren't the first to protest. The world is full of sad, disillusioned and frustrated middle-aged ex-revolutionaries, whose idealism has given way to bitterness. Once they too were angry. They could no longer tolerate the way things were. They joined a movement — and sometimes even succeeded in overthrowing the established order. Once in power they had their chance to solve the problems. As they grew older, the young firebrands discovered that they did not have the answers either. Now they often resort to force and repression to stay in power, for a new generation is waiting in the wings — angry and impatient — eager for their chance. They have learned what revolutionaries always must learn — all they had to offer was just another way of messing things up. To make a protest that counts, you need first to understand the real nature of the problem, and second, you should be able to offer a solution. Otherwise you are just adding to the sum total of misery and frustration in an already confused world. Ask yourself, Do you really understand what is wrong with the world today? Why aren't problems being solved? Protesters think they know. Revolutionaries believe that problems would be solved if only this government was toppled, or that person was removed from office, or such and such a law was passed so that this or that group could be given their "rights." It isn't as simple as that. The problems of this world go deeper. You must understand what has gone wrong and why. Only the person who understands this can begin to take steps that will succeed in making things better. In the opening pages of the Bible is a story of Adam and Eve in the garden of Eden. You probably know the story — of how God forbade the first man and woman from eating the fruit of a certain tree in the garden. But, in the guise of a serpent, Satan persuaded them to disobey. Most people now dismiss this as myth. By doing so, they miss the real significance. When Adam and Eve decided to listen to Satan, rather than God, they laid the foundation for the world we know. They, in a sense, decided to protest against the rules God had outlined to them. They played right into the hands of the archenemy of the human race — Satan. There is a fascination with Satan today. It comes out in many of the themes and settings of the video music tapes. Older people may be appalled — but the young tend to find Satan entertaining and even a symbol of protest. How terribly deceived they are. You need to know more about Satan. Satan does exist, and he is far from being a figure of fun and entertainment. He was once one of the most powerful angels that God had created. When his own visions of grandeur were thwarted, he became the mortal (or rather the immortal) enemy of God and everything that God is doing. Satan thus became the deadly opponent of all mankind. Jesus told us that Satan has no other purpose for dealing with us except to "steal, and to kill, and to destroy" (John 10:10). He wants to see the end of all human life — including yours. Because people today have no idea what human life is for, why they exist, and what God's purpose is in creating man, they tend to disregard Satan's influence. If they did understand, Satan's evil and cruel deceptions would become all too evident. God's intention was (and is) that man should have life forever. The time spent on earth is meant to be a training and qualifying period — so that men and women can learn how to enjoy life. God will not inflict an eternity of misery and confusion on those he loves. Before we are given real life, we must learn how to live it. From the day Satan met Adam and Eve in the garden of Eden, he began to influence them to live the wrong way. He encouraged them to decide for themselves what is right and wrong. He helped them lay the foundations of a world based on vanity, jealousy, envy and greed and selfishness. That is the world we have today. People want to be happy, and most people want to be good, but how many want to do what God says is good? Satan has never swerved from his purpose. His goal to see mankind destroyed springs from a deep reservoir of hate. He is bombarding the world today with wrong ideas, seizing every opportunity to erode values, destroy standards, and sow confusion, frustration and misery. He will do anything and everything to keep mankind from finding the only way that would produce the results that we all so desperately crave. That is why your world can't solve its problems. It began to go wrong from the beginning, when the first man and woman were in effect kidnapped by a powerful and terrible enemy. So, if you want to make things better, aim your protest at the real cause of the problem. You don't have to work for the overthrow of Satan. That has already been accomplished. Jesus Christ has already qualified to replace Satan. When God is ready, he will send Jesus Christ to banish Satan from the earth and take over the rulership of the nations himself. Jesus Christ will guide all people into a thousand years of peace and prosperity. Through the ages, Christ has called a people to prepare to help him with that task. They are people whose eyes have been opened to understanding the truth. They have been able to see this world for what it is, recognize the true nature of the problem and begin to do something about it. Jesus Christ has not called them to rebel against society or to overthrow governments. He will resolve the problem at the right time, and in the right way — . He has called them to educate and prepare themselves to help in the world of tomorrow. That very preparation is a protest, for the most effective protest that a person can make today is to begin to live now according to the laws of God that are for our own good. That is not as easy as it sounds. It will make you truly different. It is not a case of distorting the way you dress or adopting some novel hairstyle. (And forget those pictures of Christ — he didn't look like that.) The change must be made inside. Alter your mind — not with drugs — but with a new way of thinking. People who will take the trouble to find out what are the real laws of God and obey them — they are the real nonconformists today. Those who have determined to repudiate the life-styles inflicted on the world by its captor — those are the ones who are launching the most effective protest ever, striking at the very roots of the real problem. It is tragic that many young people today, so discontented with the way things are, are cheating themselves of a chance to really help. First, in their protests, they are only adding to the confusion, and aiding and abetting the very system that is causing the problem. Second, they are destroying their potential to help put things right. The attitude of protest is the same as it ever was, but the means of protest have changed. Satan has seen to it that today's young people have access to a formidable arsenal of self-destruction-mind-destroying drugs, intellect-destroying entertainment and a choice of liberal, permissive and often perverted lifestyles. The effects cannot be easily reversed. Many of today's young protesters are inflicting problems on themselves that they will not just grow out of. Listen — you might be successful in shocking your elders, and even giving yourself a temporary high. But if you are destroying your potential for the future, you are thwarting yourself. It is indeed a foolish protester who cuts off his own chance to put things right. There is a lot of good that can be done even today. "Band-Aid" showed that. But the world's problems are too big for a "Band-Aid" — the earth needs 1,000 years of intensive care — and only God can give us that. I haven't told you the whole story. There's not space in one article. But if you've stayed with me this far, perhaps you'll want to learn more. This magazine does claim to have insight into what has really gone wrong, and how you as an individual can begin to start to prepare to put it right. You'll have to make up your own mind, of course. You are right not to be content just to sit back and let this awful world happen. But make sure that your protest is a part of the solution, rather than yet another symptom of the problem.